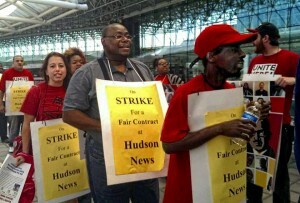 Hudson News workers on strike, May 22. On May 22, fast-food workers at Baltimore-Washington/Thurgood Marshall Airport, supported by UNITE HERE Local 7, picketed the airport in three shifts: from 6 a.m. to 8 a.m., 11 a.m. to 2 p.m. and 4 p.m. to 6 p.m. The one-day strike was held to inform airport patrons of the deplorable conditions and low wages at the airport’s fast-food and beverage stores, such as Subway, Dunkin’ Donuts, DuClaw’s, Silver Diner and Sam Adams. The Hudson News workers participated in the one-day labor action because of mounting frustration over contract negotiations that have been going on for more than seven months without any offers of sustainable wage increases, decent benefits, job security or an equitable overtime policy. UNITE HERE represents 1,400 Hudson News workers at a dozen airports across the country, including at BWI Marshall. The union represents 10,000 workers at 27 airports throughout the United States; they have regular wage increases, benefits and job security. AirMall is the conglomerate that oversees and regulates the fast-food and beverage establishments at BWI Marshall in true “mobster” style. The company requires that these establishments pay a 30 percent retainer fee in order to maintain their status at the airport; they must cough up 30 percent of their profits to Airmall. In order to stay “competitive,” the fast-food and beverage shops then force low wages on the workforce. This is “trickle-down” economics at its best. According to Michael Hachey, UNITE HERE organizer, this “requirement” was brokered under former Maryland Republican Gov. Bob Erlich. UNITE HERE Local 7 has also been demanding of HMSHost — which operates Starbucks and Phillips Seafood restaurant — a fair and neutral card check process, free from intimidation and harassment, so its workers can sign up to join the union. With card check, unions can forgo the long and lengthy process of a union election during which companies are free to intimidate and harass workers — with captive audience meetings before an election is even granted. The union then has to engage in a long drawn-out legal battle for a negotiated contract. With card check, union recognition is granted if more than 50 percent of the employees sign cards to join. This was a demand by the labor movement described as the Employee Free Choice Act, which the Democratic Party “promised” the unions in return for labor support and money for Democratic candidates. However, the erstwhile “friends of labor” quickly and quietly shelved this demand in order to placate their corporate masters. 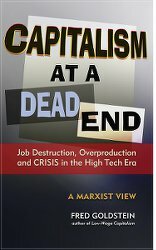 Unfortunately, with some notable exceptions, most of the labor movement also buried it. Also showing support for the workers at BWI Marshall were the Baltimore Workers’ Assembly, the People’s Power Assembly, Food and Commercial Workers union Local 1994 and the Communication Workers of America. The latter two organizations are organizing Veolia SuperShuttle drivers. Also attending were members of the American Federation of Government Employees (AFL-CIO) and the Interfaith Workers for Justice of Maryland.